After a hot and sunny work week we'll continue to deal with Mid-South heat as a hotter than average start to meteorological fall begins this weekend. However, the overall weather pattern is certainly more interesting than the previous week, with chances for rain entering the forecast. This potentially wet weather could also bring some relief to high temperatures heading into next week, but first let's focus on labor day weekend. Above is a satellite image of water vapor in the mid-levels of the atmosphere. The main focus in this image is the low-pressure system and associated moisture centered over the northwest corner of Arkansas. This low-pressure system is embedded in a broad area of high pressure that has persisted since last week and is now moving close enough to the Mid-South to influence our weather. This low is essentially an area of cold air aloft and will help to erode the lid on the atmosphere that is preventing clouds, and thus rain, to form. The 24 hour forecast of the 18Z NAM above shows the area of cold air aloft, as well as the associated dip in pressure due to the higher density of that cold air. As this upper-level low sits to our southwest, it will continue to bring in moist air which will result in clouds and chances for rain. As the ridge slowly shifts to the west heading into Labor Day, we'll see a cold front move through the region bringing slightly cooler temps and decreased humidity for next week. Saturday: Partly cloudy with a high of 97, low of 77. Isolated showers/t'storms. Sunday: Partly cloudy with a high of 96, low of 77. Slight chance of showers/t'storms. Monday: Mostly cloudy with a high of 94, low of 75. Chance of showers/t'storms. Download our iPhone or Android apps, featuring a fresh new interface and StormWatch+ severe weather alerts! As most of our readers know, MemphisWeather.net is staffed by yours truly (meteorologist and founder Erik Proseus) as well as social media interns who assist in nowcasting on our social media platforms and occasionally blog on local weather patterns. Currently, the interns are two Mississippi State University graduate students in Meteorology: William Churchill and Patrick Luckett. This fall I have a unique opportunity to assist one of them on a class project, as well as hopefully increase the amount of content posted to this blog. William, who has served as an MWN intern since late this spring, will be cross-posting his own blog (required for his Weather and Forecasting class) to the MWN Blog. We expect that this will keep this blog more current with respect to content on local weather patterns, while also assisting William by allowing more viewers to see his fine work and meeting requirements for his forecasting class. I am pleased to have William post regularly on the MWN Blog and hope that you will enjoy his content! Please note: William's content will be posted verbatim on the MWN Blog. Any commentary by Erik will be noted in brackets [EP: like this]. Also, no two forecasters present the same forecast. It's the nature of interpretation of the available data. William's forecast will be included if it is a part of his blog. It may not match the MWN Forecast. Consider it simply a "second opinion." :-) We look forward to any feedback that you have! Even though it’s nearly meteorological fall, summer seems to just be getting started in the Mid-South. 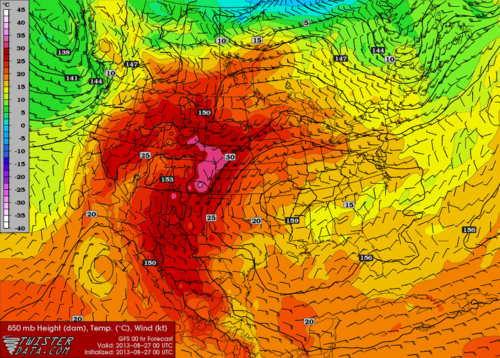 Above is an initialized map from the GFS showing a large area of high pressure nearly directly over the mid-south. This high pressure is expected to remain over the area for the majority of the week, before weakening and easing west. 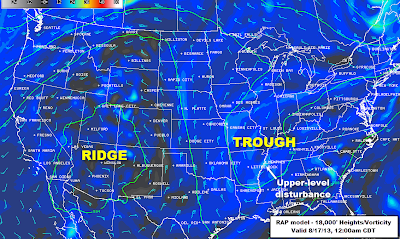 However, the effects of the ridge look to be present for at least a week before subsiding a bit. MOS guidance suggests several days towards the end of the week near 100 degrees. This combined with humid air will make for an uncomfortable start to September. The death ridge will remain strong enough to prevent any rain for some time. In fact, the next chance of rain could be associated with a trough moving east to west due to the ridge weakening and shifting west. Any significant precipitation still seems unlikely as we’ll just eventually be able to get some afternoon storms due to a weakening cap on the atmosphere. While there have been few complaints overall about the mild summer we have experienced, a heat wave will likely make us forget about the cooler temperatures as we head into the last week of August and Labor Day weekend. Below, a video forecast discussion covering the whats and whys of the heat wave, including how hot it could get. The heat wave could bring us the highest temperatures we have experienced all summer by the end of the week (so far, 97 is the warmest it has been). Plan accordingly and practice heat safety as heat indices rise above 100-105. Introducing StormWatch+ EnRoute dynamic weather alerts! StormWatch+ precision severe weather alerting was introduced to the MemphisWeather.net mobile apps nearly two years ago and has been one of the most popular features of the apps according to feedback received from our users. StormWatch+, in a nutshell, cross-references the location(s) the user sets with multiple types of watches, warnings, and advisories issued by the National Weather Service and alerts the user when they are in a warned area. The alert is received as a push notification that appears in the notification area at the top of the user's device, as well as an audible sound. The great thing about StormWatch+ is that it doesn't care what county you are in for Tornado, Severe Thunderstorm, or Flash Flood Warnings. The NWS no longer issues those warnings by county. It issues polygons that indicate the area that will likely be affected by the storm, irrespective of county lines. Thus, the alerts you receive from StormWatch+ are PRECISE. If your latitude/longitude location is inside the polygon, you get a warning. If not (you're outside the polygon by 2 blocks), you don't! 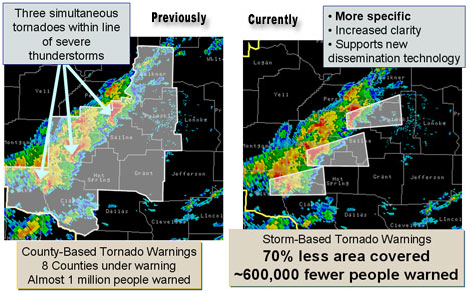 Prior to 2007, county-based warnings in the example above warned almost 1 million people of 3 separate severe storms. With polygons, 70% less area is warned and 600,000 fewer people would take shelter due to more precise warnings! This precision allows for very specific warnings to be sent only to those within the alerted areas. One of the features that has been high on our "To Do" list since the creation of StormWatch+ is the ability to alert people who are traveling when they approach hazardous weather. A static location registered by the user doesn't help a great deal in this circumstance. Well, we are excited to be able to cross this item off our list with the introduction of StormWatch+ EnRoute dynamic weather alerts! When activated, EnRoute will continuously monitor your location and cross-check it against known severe weather warnings, alerting you as soon as you travel into a warned area - even if you don't have the app running in the foreground. It's like having a sophisticated Weather Radio in your car - keeping up with warnings and your location and sending you an alert if you are headed towards a severe storm or flooded roadways! One of the great features of StormWatch+ EnRoute is the ability to select how often the app should check for warnings as you travel. 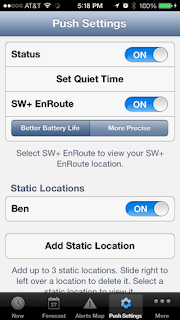 You can choose between "Better Battery Life" or "More Precise." With "Better Battery Life," your location will be checked using the Location Services built into your device (not GPS). This will allow for updates to your location (which triggers a check for warnings) every few minutes, provided your location has changed "significantly" (which varies whether you are in a rural or urban environment, but is no less than every 1-2 miles). For most people, this is plenty sufficient and still provides a heads-up before encountering any severe weather. In "More Precise" mode, GPS is used to update your location every few seconds, which triggers many more calls to the EnRoute server to check for warnings and also causes your device battery to be adversely affected. We only recommend this mode if you are able to keep your device on a charger. Either way, you get peace of mind by not having to wonder if the dark clouds you are approaching are just another rain storm or a harbinger of high wind, hail, or possible tornadoes. Where can I get StormWatch+ EnRoute? As of August 21, 2013, StormWatch+ EnRoute is available in the MemphisWeather.net app (when the StormWatch+ service is purchased separately within the app) for iPhone and iPad users. We expect to release this upgrade to StormWatch+ for Android users in the coming week or so. We also will roll this technology into the separate StormWatch+ app for iPhone/iPad users nationwide in the next two weeks. Click one of the links below to download the appropriate app and be sure to upgrade within the app to add the StormWatch+ technology! For more information on StormWatch+ EnRoute, including FAQs on what warning types are available and when you will receive alerts, visit our StormWatch+ website. Questions? Hit us up on Facebook or Twitter (links below), comment on this blog, or e-mail us at support@stormwatchplus.com. What a pleasant reprieve we have had the past few days from typical August conditions! Actually, after a below average July temperature-wise, August is running nearly as much below average as July was. Through the first half of the month, the average temperature has been 1.8 degrees below normal at Memphis International. As we indicated this past weekend, a cool spell has dominated the second half of this week with many areas seeing morning lows in the upper half of the 50s the past couple of mornings, while afternoon highs have been near 80 for 3 straight days now. In fact, the official low of 60 on Thursday morning was 2 degrees above the record set 60 years ago! Driving this cool pattern has been another large-scale trough over the Great Lakes and Mississippi Valley, similar to the setup we have experienced multiple times this summer that has contributed to cooler than normal conditions. An upper-level trough pushes the jet stream to the south and allows cooler air normally reserved for Canada to dip south under the trough. With a trough nearby, disturbances in the atmosphere ("flies in the ointment" we like to call them) can move through, triggering showers and thunderstorms. At the jet stream level, a large trough dominates the Mississippi Valley, bringing well below normal temperatures to the eastern U.S. The jet stream (represented by the blue colors above) has been shoved well south of it's usual summertime position. Once such disturbance is approaching the area today, moving across Arkansas and towards west Tennessee this afternoon. It will bring a slight chance of showers to the metro later this afternoon and evening, though it is so weak that it's not producing much in the way of precipitation, and certainly nothing strong. As the trough lingers, we'll see continued small chances of rain through the weekend, but no washouts and nothing to change plans over. The additional cloud cover will help moderate temps for another couple of days. In the mid levels, the trough is evident in the east as massive high pressure dominates the western U.S. An upper-level disturbance (lighter blues on the map) will be nearly overhead at midnight, but little in the way of precipitation is expected. By next week, the summer ridge of high pressure will move back in and bring with it more typical August weather, though not excessively hot. Most of next week should be dry, but a few disturbances could trigger scattered showers or thunderstorms, especially to our east where an upper-level low could take up residence. Highs will be back in the lower 90s with August mugginess and warm nights in the 70s. I guess we can be thankful for a fairly mild summer and definitely a few days this week that felt more like late September than mid-August! Find the complete 8-day MWN Forecast for the weekend and next week here (mobile link). 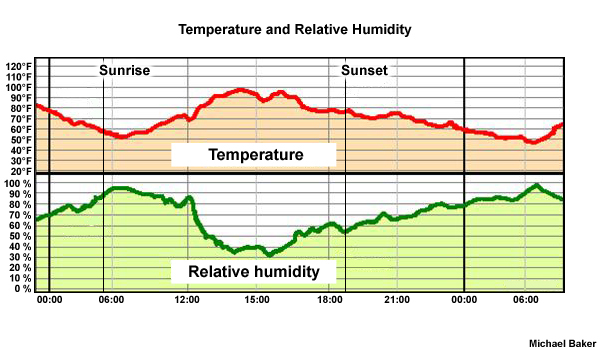 Humidity can often be a misunderstood concept due to the different ways in which it is measured. The most familiar of these measurements is probably relative humidity. Although it is most familiar, that does not mean it is the most understood. In fact, it’s probably the least understood. Relative humidity is measured as a percentage and its name is appropriate because it truly is a relative measurement. Saying the humidity is 75% outside tells you nothing about how humid it actually feels. The percentage is relative to the current temperature. For example, a cold winter morning could have 100% relative humidity and the temperature could be 35 degrees. This just means the temperature of the air has dropped to the point of saturation. Now, on a warm summer night the humidity can also be 100% and actually feel incredibly humid. Let’s say the temperature in this situation is 75 degrees. In both situations, the relative humidity is 100%, but without knowing the temperature you have no idea what this humidity actually feels like. Clearly the cold winter night feels much less humid than the warm summer night, although both measurements of humidity are the same. This brings us to the superior measurement of moisture in the air, known as dew point. Dew point will tell you exactly how humid the air is regardless of the temperature. It is a measure of "absolute humidity," or the actual moisture content in the air. In our previous example, since the relative humidity was 100%, the dew points were equal to the temperatures, meaning the air was saturated in both cases. But a dew point of 35 degrees is very different than a dew point of 75 degrees! Just like higher temperatures equal hotter conditions, the higher your dew point is the more humid it feels, because the amount of moisture in the air is higher. A dew point in the 70’s, which is very uncomfortable to most people, can be common on a southern summer day. The dew point may not change much during the day, remaining in the 70’s. Our example demonstrated exactly how useless relative humidity can be when you want to know how moist the air actually is. This is because relative humidity gets close to 100% just about every night, while it gets lower during the day as the temperature rises - even if the dewpoint does not change! In other words, relative humidity is always changing. As you can see relative humidity and temperature are inversely related. Dew point is an actual measurement of the current moisture content of the air, not relative to the current temperature of the air. So the next time someone says "the humidity is awful this afternoon," you will know that they are likely referring to the dew point even if they don't know it! Humidity is relative - dew point is not! For well over a week, NOAA's Climate Prediction Center, which issues medium range forecasts that go out up to 14 days, has been advertising a cool spell for mid August. I tried to imagine that as I sweat through my clothes Friday morning while mowing the yard in upper 70s dewpoints and 80% humidity! Turns out, it looks like they were right... but more on that in a minute. For the first half of this week, we get to deal with a rainy, humid pattern that results from a frontal system that has taken up residence over the region. When the front was north of us, it was the railroad track that allowed training storm systems to flood southern Missouri and portions of northern AR. The past day or so, it slipped south and brought much of the metro a couple of rounds of thunderstorms (nearly 2" fell today at MWN headquarters in Bartlett). As of this evening, it has again retreated just to our north, but will remain in the area until it gets a good shove from a stronger system and change in the upper level wind pattern. So, for the next couple of days (at least into Wednesday morning), the front and tropical moisture from the Gulf will mean continued humid conditions and chances of t'storms. In fact, as the front draws closer again on Tuesday (this time pushed by another cold front that will finally "clear the air" of all this humidity and rain chances), thunderstorm chances will increase - with a good chance everyone sees decent rainfall by Wednesday morning. Any storms will be capable of very heavy rain thanks to the moisture-laden atmosphere overhead, as well as copious lightning and a few strong wind gusts, especially from any afternoon storms in near-90 degree air. 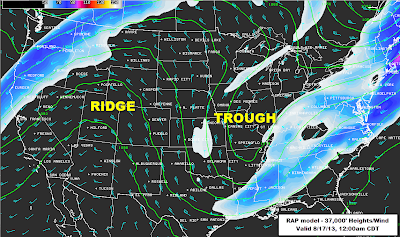 A trough (basically a "valley" in the upper-level weather pattern which typically hosts cooler air) will set up over the northern half of the eastern U.S. This trough will finally push a humidity-busting cold front through the Mid-South. With cooler high pressure at the surface building in over the Ohio Valley, we'll finally see an end (even if temporarily) to the oppressive humidity and rainy pattern. In addition, temperatures will be below normal to end the week and start the weekend! Recall that it will still be August though, which means summer is not over, but hopefully everyone will appreciate the reprieve and early taste of autumn! A couple of graphics below demonstrate the change in airmass and it's results for Mid-Southerners. On Friday morning, the GFS model shows a significant trough across the Mississippi Valley at the 30,000' (jetstream) level. 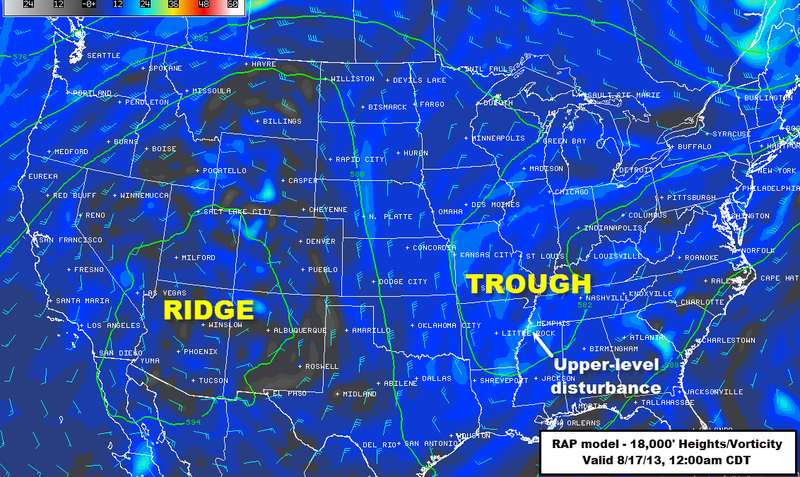 Upper-level troughs indicate an intrusion of cooler air into the region under the trough. 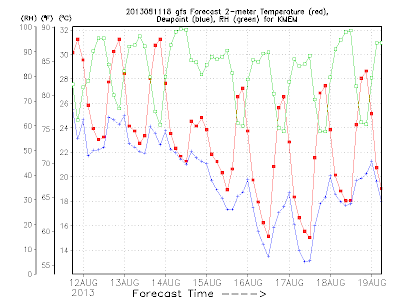 GFS model temperature (red), dewpoint (blue) and relative humidity (green) for this week. Note in particular the dewpoint drop beginning Wednesday the 14th , with some 50s early Friday and Saturday mornings. Also, note temps that peak in the lower 80s late this week and fall to near 60 a couple of mornings. 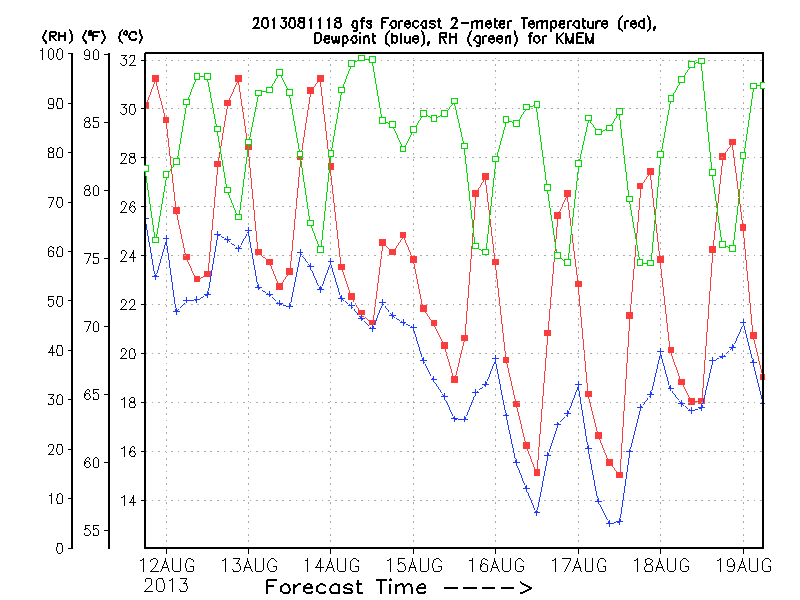 This is an early guess and is likely overstating cool air, but it's a hint of early fall weather that is likely. Last note: tonight and tomorrow night are the peak viewing nights for the annual Perseid meteor shower. It's a shame that the weather pattern is promoting clouds across the area, because this meteor shower is typically one of the best of the year. 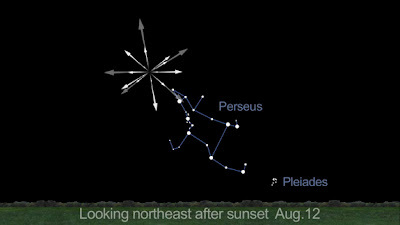 Perseids can be visible dozens of times per hour given the right conditions. If you want to try and see a few, the best viewing is done well away from city and artificial lights, looking straight up, from midnight until just before dawn. If you just want to learn more, here's a great article from Space.com: Perseid Meteor Shower is Peaking Now: How to Watch and here's a site where you can watch the meteors live online! Just when we think we've semi-figured out the best way to use Facebook for social media weather nowcasting, Mark Zuckerburg changes things up again. We've blogged before about how many most of our Facebook fans (no less than two-thirds of them) are not seeing our updates, no matter what we post or how we post it. We employ various techniques to reach as many of you as possible, but there seems to always be a cap on how many of our fans will see our information. Today, Facebook announced a few changes for Fan Pages that will require us to continue studying how many of our "likers" actually see our content and what types of posts work best. However, the main points continue to be the main points if you are on the receiving end and want to see all of our content. You can substantially increase the chance of seeing what we post by engaging our posts (i.e., liking, commenting on, clicking on, or sharing). The more you engage our posts in the ways mentioned above, the more you'll see. This includes engaging the different types of content we post to see more of that type of post (i.e., text updates, links, pics). Also factored in are things like how often any of our fans, and even YOUR friends, engage our posts. The more engagement, the more eyes see the content. Facebook uses all of this information to try and determine what you are most likely to want to see. Again, check out this previous post for more detail on increasing your chances of seeing our posts. One of the big changes introduced today is that Facebook will begin placing older Fan page content back near the top of people's News Feeds, to increase the chance it will be seen. There is an inherent risk with this that applies directly to what we do, which is provide chronological updates of weather information. Lifting old content back into a News Feed means you might see information in your recent feed on storms that are long gone. We have been, and will continue to, timestamp all nowcast updates that are perishable, or aren't valid after a short period of time, and will re-double our efforts to make sure we do that given these changes. The last thing we want you to see is a "take cover" Tornado Warning statement that you don't realize is a couple of hours old. Just know that you MAY see old content in your feed with the latest changes. All of this causes us to again pause and take stock of how we use social media, in this case Facebook. 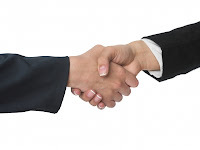 It is no secret that we strongly prefer Twitter to Facebook for what we do. It's clean, orderly, chronological, unfiltered, brief, easy to share, and simply preferred for "news" sharing. Facebook is great for personal socializing and works for us for content that is not perishable (despite the fact that a neat picture might only get seen by one third of our fans). It does not work well when you need a chronological, unfiltered feed of information. For now, we will make no changes to our use of Facebook, despite these fallacies. However, we STRONGLY ENCOURAGE anyone that follows us on Facebook and has a Twitter account to follow MWN on Twitter as well. In fact, we like Twitter so much that we think that it's worth you opening a Twitter account just to keep up with current news and weather information. The ability to mobile follow (especially our automated StormWatch warning feeds) is icing on the cake. If you don't want to open a Twitter account, but want to see our unfiltered, chronological updates from our Twitter feed, you can either view our auto-updating Twitter app that is embedded within our Facebook page (thus allowing you to remain on Facebook, even though you are tied to a single Facebook page), or check out our Twitter feed in the MemphisWeather.net iPhone or Android apps. Both are great ways to follow and know you're not missing anything, especially during severe weather. It is unwise (and that's saying it nicely) to rely on a single source of weather information, during severe weather in particular. All sources have fallacies and may stop updating. This includes our nowcast feeds and mobile apps. Commercial TV, radio, multiple weather apps, or NOAA Weather Radio are all good sources of information. Our biggest fear is that someone solely relies on our Facebook feed for severe weather updates and Facebook decides not to serve up the Tornado Warning post to their feed. God forbid someone gets injured or worse because they relied on Facebook EdgeRank (or even a Twitter feed for that matter) to deliver their warning information. We're reliable, but make no guarantees! 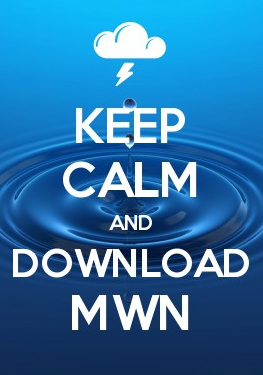 We appreciate it if you use MWN as a primary source, but have a couple of backup sources and check them regularly during severe weather. Thanks for being an MWN Facebook fan! We'd love to know your thoughts or comments. Feel free to post them on our Facebook page or leave them in the comments section below. It's time to dispel a weather myth! Myth: Heat lightning happens on warm summer nights without the presence of a thunderstorm. Truth: Heat lightning does not exist. I know, you've heard, or maybe even used, the term forever! It's the distant lightning, with no thunder, that you see on a warm summer night while taking an evening walk, right? Wrong! All lightning originates from a thunderstorm. At night, it is easy to see the lightning from great distances (as far away as 100 miles under optimum conditions from tall storms that reach up to 50,000-60,000'!). The sound of thunder does not travel as far as the light from lightning, as sound dissipates with distance. However, just because you don't hear thunder does not mean there isn't a thunderstorm. If you see lightning, there is always a thunderstorm associated with it. Check your favorite radar source in the direction you saw the lightning from. We guarantee there will be a storm out there somewhere! Distant lightning, commonly referred to as "heat lightning." Photo courtesy Wikipedia. Do you have a suggestion for another edition of "Mythbusters, Weather Edition" or want us to check into whether something you have "always heard" is true or just an old wives' tale? Drop us a line on our social media channels (listed below) or comment on this blog! We'll try to include your question in an upcoming edition. Be sure to include your name so that we can give you credit for your question! As one might expect in July, rainfall across the metro was unevenly distributed thanks to pop-up thunderstorms that brought heavy rain to small areas. However, the month was unusual from a big weather picture perspective as it was dominated more by northwest flow weather events than a strong Bermuda High and afternoon airmass storms. Though many of the showers and thunderstorms moved north and east of the metro, their presence in the region resulted in below average temperatures for the month due to increased cloud cover. Severe weather was negligible. Climate details for July can be found below. The average temperature for the month of July was 80.5 degrees, or 2.2 degrees below normal. The average high temperature was 89.1 degrees and the average low was 71.8 degrees. The coolest temperature of the month was 64 degrees on the 2nd, while the highest temperature was 96 degrees on the 11th and 17th. For the year, Memphis is 1.1 degrees below average temperature-wise and, compared to last July, this month averaged 4.8 degrees cooler than July 2012 with a heat index that averaged 8 degrees cooler (93 in 2013 vs 101 in 2012). Precipitation for the month totaled 3.73", which was 0.86" below the average monthly rainfall. No daily rainfall records were set. There were eight calendar days with measurable rainfall, three of which recorded at least 0.5" and one which saw 1" or more. 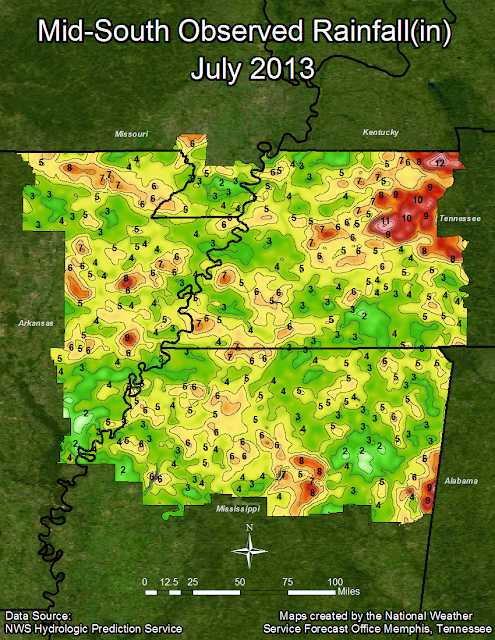 Through July 31, annual precipitation at Memphis is over 11" above the 30-year average. The maximum 24-hour rainfall was the record 1.82" on the 22nd-23rd. The peak wind was a 33 mph thunderstorm-induced gust from the northeast on the 18th with an average wind speed for the month of 6.8 mph. Click here for a daily statistical recap for Memphis International Airport. The average July temperature at Cirrus Weather Solutions was 78.1 degrees with a maximum of 96.1 degrees on the 9th and a minimum of 59.4 degrees on the 13th. July precipitation measured only 2.98" via the Cirrus automated gauge and 3.15" in a manual gauge used for the CoCoRaHS program. The measured peak wind gust was 16 mph on the 14th. Average relative humidity was a muggy 78%. Click here for a daily recap on MemphisWeather.net. For the month of July, the average temperature error in all MWN temperature forecasts was 1.76 degrees, lower than all available computer data models and the National Weather Service forecasts. Nearly 75% of the MWN temperature forecasts for the month were within 2 degrees of the actual temperature. MWN's forecasts extend out five periods (2.5 days, or roughly 60 hours). For dewpoint accuracy, the MWN forecast averaged 1.62 degrees error and fell within 2 degrees of the actual dewpoint 77% of the time. Historical accuracy statistics can be found here. With many school districts around the Memphis metropolitan area starting back this week, not the least of which is the Shelby County district, we offer this look ahead to help parents (and kids) figure out just how to dress to fit the weather. Unfortunately, a pattern similar to what we've experienced for long stints this summer continues - which will mean rain possibilities to start the week, though negligible chances of severe weather. For Monday, we expect a day that could be very similar to Saturday with a weakening thunderstorm complex moving into the area from northern AR early in the day. For those with early bus pick-ups, the rain may not be here yet by 6am-7am, but check StormView Radar before you send the kids out. An umbrella might be a good idea. Rain chances increase for later school start times and could very well be in the area by 9am. Rain could very well keep kids indoors during recess or other outdoor activities during the day, though most of it should be gone by school dismissal times. Temps will remain in the 70s to lower 80s where it rains, but humidity will be high and any sun in the afternoon will cause temps to rise into the upper 80s with high humidity. On Tuesday, a repeat scenario is possible, but the chances look a little less likely. These storm systems can be hard to predict more than 24-36 hours in advance so the crystal ball is a little less clear! Plan for at least some chance of rain on Tuesday (right now we have 30%), warmer temperatures (especially if there is less rain than Monday - we've got 93 for a high), and humid weather continuing. Wednesday and Thursday will likely be the warmest days of the week with rain chances at their lowest - just isolated afternoon chances. High pressure will push temperatures into the mid 90s with heat indices possibly reaching the 104 mark where outdoor activities are affected per local district policies. Friday is tough to call, but could end up as warm and sticky as mid-week. Stay tuned. We invite parents, teachers, and staff to check the MWN Forecast regularly for the latest weather information, as well as liking us on Facebook or following us on Twitter for even more frequent updates (links below). Also, our mobile app for Android devices and iPhones/iPads puts the MWN Forecast and regular Twitter updates (even if you aren't on Twitter), as well as full-screen StormView Radar, in your pocket or purse for quick access. A download link is provided below. For principals and other administrators, MemphisWeather.net is able to provide customized StormWatch+ warning services specific to your school campus. We deliver the weather alerts the way you want them - you pick the weather warning types, the hours of the day you wish to receive them, and the delivery method you want and we'll send them for your specific school location! This customized StormWatch+ delivery service has been in use for a couple of years at select trial locations in Shelby County and has delivered exactly as promised! Contact support@stormwatchplus.com for further details.